Investors were shedding their stock and gold positions yesterday as the days favourite was the US dollar. The cause of this action was the speech from ECB president Mario Draghi, who said that unlimited buying of government bonds was not an option, and that there were choppy waters ahead for the single currency. Spread betting account holders will be closely watching the second day of the EU leaders meeting and, already this morning, David Cameron has announced his rejection of the new EU treaty. So after losing $33.5 yesterday to close at $1708.1, early bird traders have not decided their reaction to the news from the UK Prime Minister and the yellow brick is trading at $1709.4. With equity spread betting markets plummeting, the energy sector was struggling to find support, and this led to a steep drop in crude prices. Even news that US initial jobless claims were at their lowest level in 9 months couldn't hold the price of black gold up. And, at time of writing, the sell-off hasn't ended with Brent crude trading down at $107.68. Gold has seen its fair share of volatility in the past few days. The precious metal is increasingly becoming a tough one to call compared to when it was almost a guarantee that any dips would be followed by another push higher. At the time of writing the yellow brick is trading at $1739 and for now it just seems to be forming a little upward channel with key levels seen at $1746/54/62 to the upside and $1722/00 to the downside. Brent has been oscillating between $106 and $112 bucks a barrel as traders in the black stuff also await the outcome of the two day EU summit. Any further strength in the shares spread betting markets could be met by equal strength in commodity markets so the bulls will be closely watching for a break above $112 to the upside. The bears, as always, will be focusing on support which is currently seen at $108.30 over the near term. At the time of writing Brent crude oil is at $110.20. No different to the majority of global markets, gold has been put under pressure by negative Eurozone activity lately. In yesterdays session we saw the yellow metal attempt a break of the $1700.0 support level. After failing to dip below this level, the tables turned and investors saw a small rally in the precious metal, pushing it up just enough to close marginally above the opening price at $1727.6. At time of writing, the commodities financial spread betting market hasn't made much more ground and is trading at $1730.2. Energy investors are also preparing to react to the news from the ECB tomorrow and the EU summit. With this in mind, crude oil prices were moving subtly alongside the direction usually provided by the equity markets and US dollar, which were also rather limited. The only boost it got was from the news that Iranian sanctions have been escalated as the EU pointed towards a common ban on oil imports from Iran. Later today, eyes will be on the US Department of Energy weekly inventories report, but at time of writing, traders have only seen a slight gain in black gold, trading at $111.38. As in recent sessions, gold tried to break through the $1750.0 resistance level yesterday but not with much luck. After using all of its strength, the yellow metal gave up and plummeted $23 to close at $1722.6. It still seems that cash is king right now and with any hint of trouble investors are dumping their gold positions to leave them more liquid. Currently, the precious metal is down just over $2 at $1720.9. With news of a possible downgrade for a handful of AAA rated Eurozone members, crude oil lost all of the gains it had seen in early trading yesterday. This week, investors will be mainly focussing on the European meetings on Thursday and Friday, where a collapse of the common currency remains a possibility. At time of writing, Brent trades at $109.58. With strong resistance around the $1750.0 level, the gold spread betting market found it hard to sustain the gains seen on Friday. So after investors saw it reach a higher high of $1763.0, they decided to start banking their profits when good Non Farm Payroll data was released. This showed that the US unemployment rate had dropped to 8.6%, the lowest level since March 2009. All in all, the precious metal rallied $4 to close at $1748.95, which at time of writing hasn't seen much action and is trading at $1745.3. An as expected rise of 120,000 US jobs last month and a lowered unemployment rate saw energy investors bump up prices of crude oil. This came on optimism that crude oil demand will be boosted in the near future, considering the continued recovery in the global economy. There was a slight limitation to the advance however, with the US Dollar rallying, but nevertheless Brent crude still closed up at $110.11. This morning Brent is a little firmer at $110.90. Gold seems to have found a bit of a ceiling around the $1750 level, having gone sideways for the last couple of days, and it doesn't seem to be benefiting from the continued bullishness in equity markets. At $1747 at the time of writing levels to watch for the gold spread betting market over the near term are $1755/70/78 to the upside and $1735/25/11 to the downside. Gold benefited from yesterday's risk appetite as speculators picked up the precious metal pushing it to $1750. This morning the precious metal, like several of the riskier currencies, is just seeing a mild bit of weakness which has taken it to $1742. The recent bounce off the $1670 level puts this as the major support level over the medium term. Those bulls that missed out on that bounce might be itching to get back in, just in case there's another big move to the upside. Brent also saw some good strength yesterday in line with other markets as it just touched $112 before seeing some profit taking bringing it back to $110 and this morning it is just in the black at $111.00. Gold has taken a turn for the worse, rejecting the $1720 level and it would seem that the precious metal is following in the footsteps of the euro and equity markets at the moment. This morning's weakness is unexpected considering that you would usually expect to see the price of gold rally on news of credit rating downgrades. This is clearly not the case anymore, so once again the longer term rally of the yellow brick is being called into question. This morning gold is trading at $1710. The same can be said for black gold with the Brent crude oil spread betting market falling back from $111.00 to $110.00 this morning. Near term support and resistance for Brent is seen at $109.50, $107.65, $106.85 and $111.95, $112.55, $113.20 respectively. Not wanting to blow ones trumpet, but the potential technical rally mentioned in yesterday's report materialised and investors witnessed the biggest intraday rally for gold seen since early November. The pressure that gold has been under due to cautious traders shying away from the non-interest bearing assets was certainly eased in yesterday's session. It was also helped by the equity and commodity markets in general. Gold closed up $31 at $1711.5. Market participants will now be looking for the next technical level of $1725, which a failure to break could result in a drop back to last week's lows. Currently, the precious metal is at $1707.2. Like the other markets, energies weren't going to miss out on a boost. With the help of the strengthening single currency and bullish stock markets, crude oil added just short of $2 to its price. The other factor was optimistic figures from the US relating to 'Black Friday', which helped accentuate the demand for crude. Only one thing dampened the session, and that was the narrowing Brent/WTI differential, which shrunk to $9 after considerable buying. At time of writing, Brent crude oil is trading at $109.2. The sovereign debt concerns weighed heavily on gold's price during Friday's session. Investors' feared that plunging equity markets would reduce 'free risk capital' and therefore long positions in the metal were liquidated. Support was provided by a firm US opening of the Dow Jones though. By the end of the session, the yellow metal was trading around mid-range at $1,680.5. At time of writing, thanks to speculation over a euro rescue package, the metal has been shunted through the resistance of $1,710 and is trading around $1713.5. From a technical point of view that could point towards a potential rally in today's trade. Crude oil saw a pullback initially on Friday as trade was thin while market participants in the US were recovering from their Thanksgiving dinners. The driving force behind the dip was the falling stock markets, pulling oil down with them. 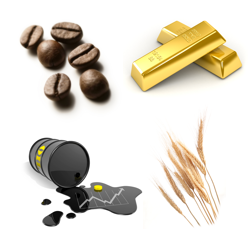 In addition to this, the single currency was under pressure which had a negative effect on the commodity markets. Things have turned this morning though and with the euro trading around 100 points up and Brent crude has been pulled up higher too, trading at $108.7.